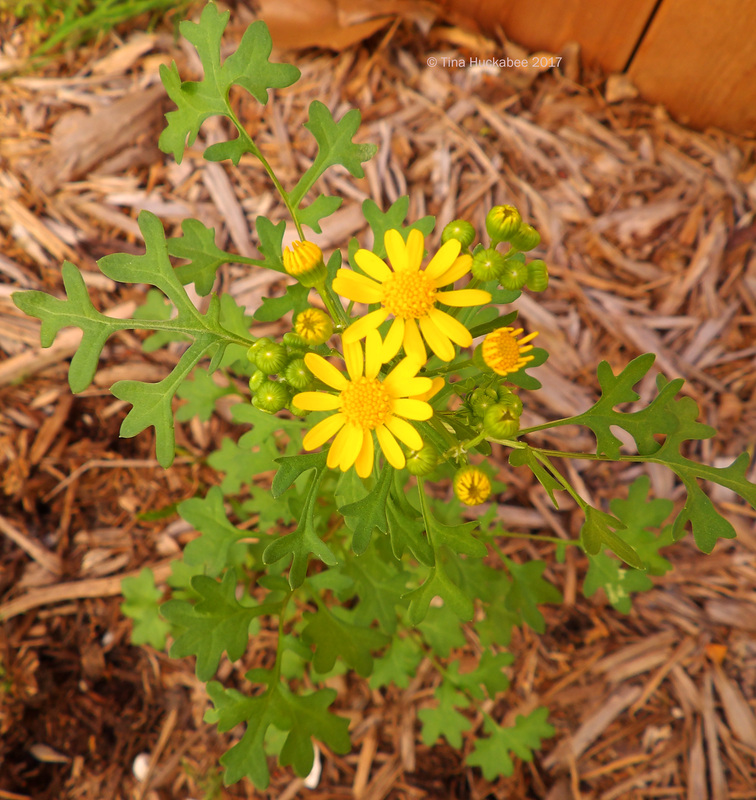 Spring just isn’t spring in my garden without the sunshine-cheery Golden groundsel, Packera obovata. The small patch has grown from two, four-inch pot sized plants popped into the ground four or five years ago to a respectable sized carpet with a seasonal yellow flourish. 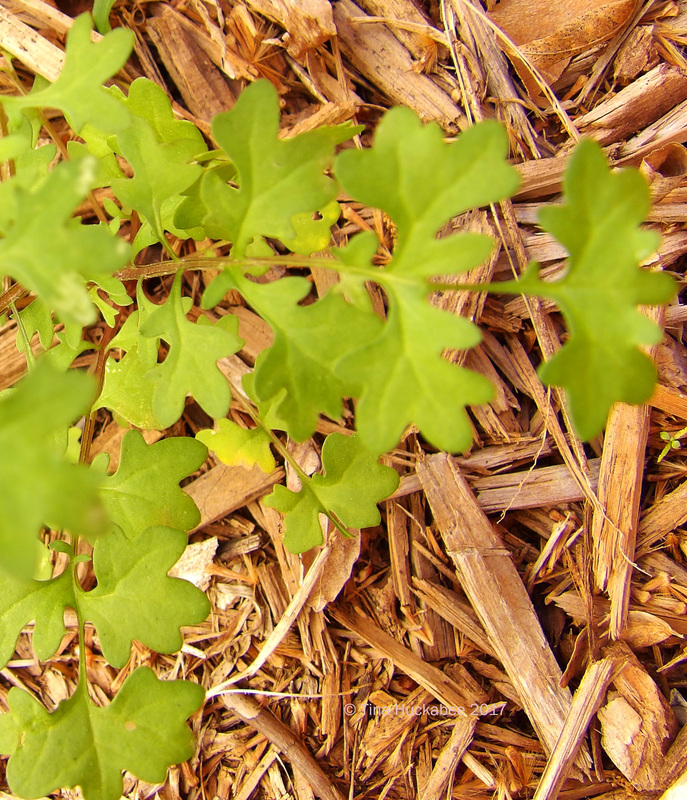 Also called Roundleaf goundsel, Roundleaf ragwort, and Squawweed, this native North American perennial is an excellent shade-loving ground-cover. The foliage is attractive year-round and the happy daisy flowers brighten the late winter/early spring garden. 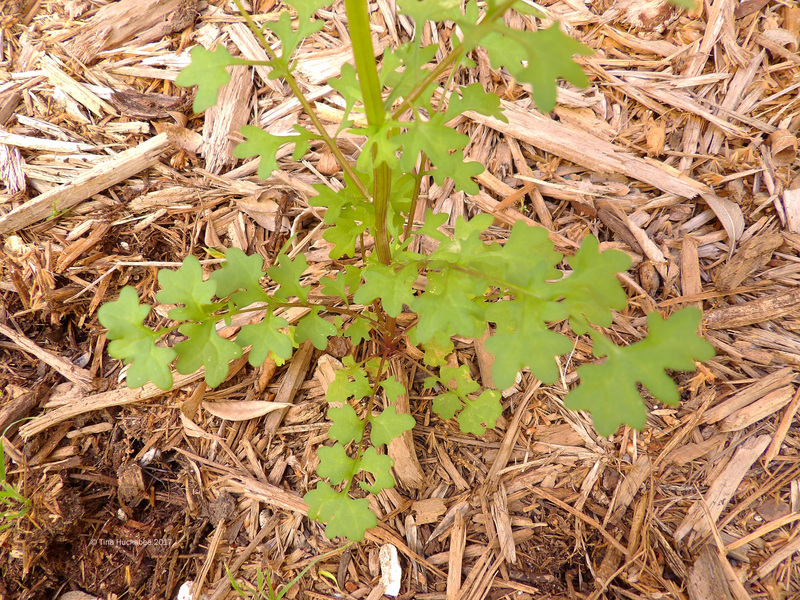 In recent weeks and at the opposite end of my property from the groundsel, I’ve watched a singular plant growing in the middle of a mulched pathway. The foliage is certainly interesting, but unfamiliar. I enjoy surprises in the garden (well, not all of them…), so I decided I’d keep–or not–the plant once it bloomed and I could better identify it. Well, the mystery plant has finally unfurled its flowers. Clearly, this pretty is a relative of the Golden groundsel, though obviously a different sub-species. I checked the Lady Bird Johnson Wildflower Database and it didn’t take long to discover that it is a Butterweed, Packera glabella. 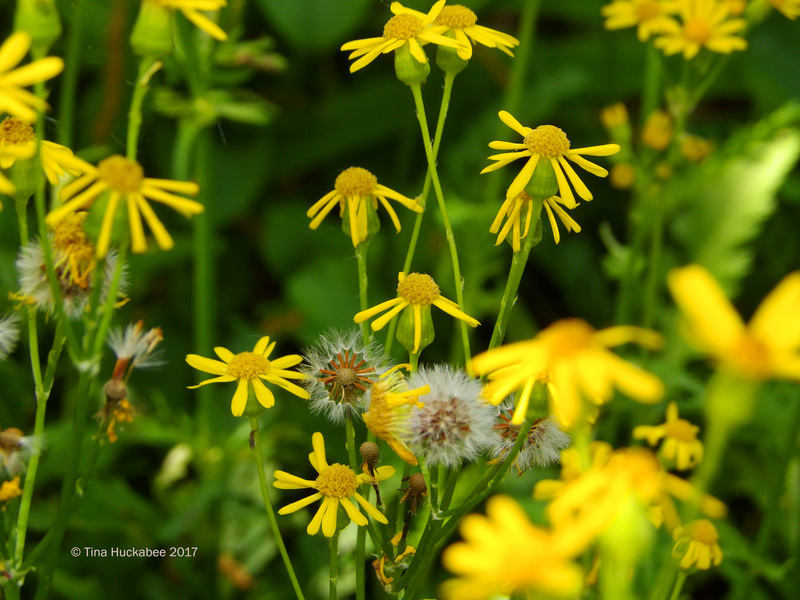 Also called Cress-leaf groundsel and Yellowtop (my favorite), it evokes the same spirit of spring as its cousin, the Golden groundsel. The flowers are almost identical. Both plants exhibit interesting foliage. The Golden’s base foliage is oval (thus the ’round-leaf’ in several of its common names) and finely serrated. Its bloom-stalk foliage is more lance-like and deeply lobed. The Yellowtop’s foliage is also rounded and deeply lobed, but with smooth perimeters. The differential in leaf color between the two plants is primarily because of light and the different times of day that I shot the photos, though the Yellowtop is a smidge lighter green than the Golden groundsel. I have no idea where this single Yellowtop came from and especially in the spot in which it grows. 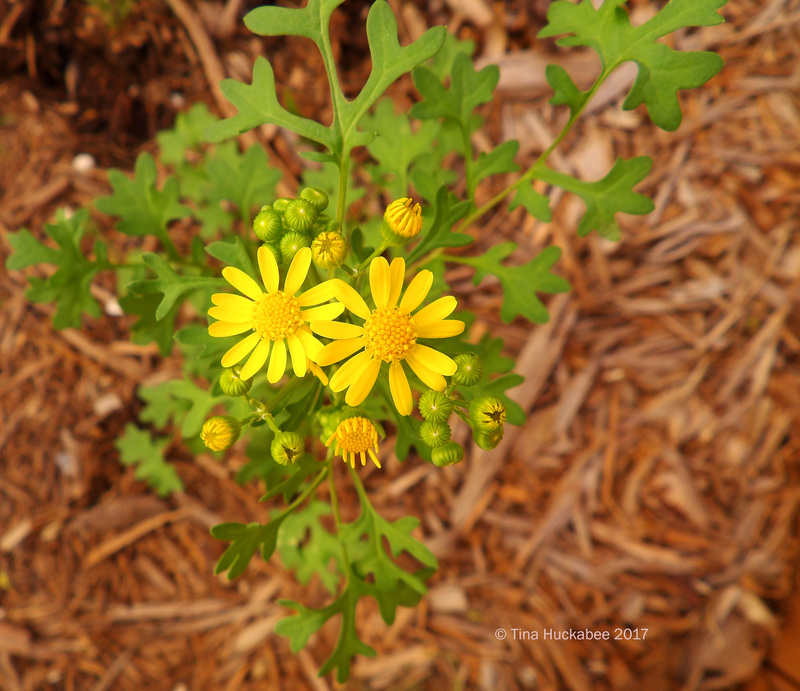 While the Golden groundsel prefers shade (mine gets a bit of afternoon sun) and is a perennial evergreen, the Yellowtop is an annual which thrives in either sun or shade. The LBJWC says that it is a prolific re-seeder and I hope they’re right because I’d love more of this little spring thing sprinkled in my gardens next year. 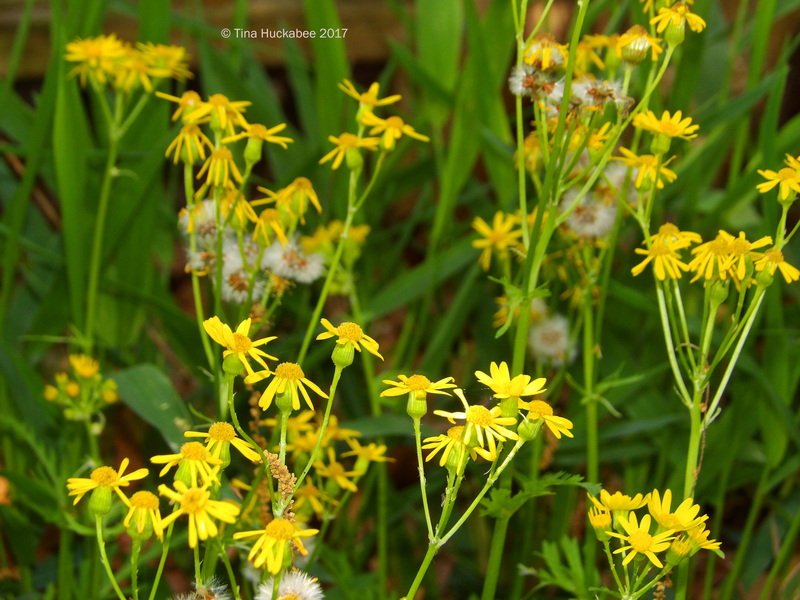 This entry was posted in Butterweed, Golden Groundsel, Packera glabella, Packera obovata, Uncategorized, Yellowtop and tagged Texas Spring Wildflowers by Tina. Bookmark the permalink. Love the groundsel cousins. Really nice pics. Thanks! The Yellowtop was challenging because it sits in a pathway between my house and the neighbor’s and the wind whistles constantly. I love the pair, too! I have let “unidentified” plants grow in my garden too, but I’m usually not as well rewarded. Plants really get around. I love to watch volunteers move from place to place in my yard. Trust me, sometimes I get junk too. I was pleased at this find though and really hope for more next year. What type of mulch do you use? How much sun does your yard receive? Mulch type depends on where I’m using it. In a pathway, I like cypress mulch; in gardens, I like the Texas native and organic hardwood, or if I’m lucky, free mulch from a neighbor’s tree/branch shredding. As for sun, most of my property is part-shade. There are a few spots of full sun, a few more of full shade. A mixed bag. How nice to get a little surprise plant. I have had this one appear in my garden too. Blown on the wind. A nice and acceptable little weed. Yes, it is nice. I like your “acceptable weed” take on things! What a fun way to learn…your conversational writing style makes finding out what will work in my new “old” backyard (new to me but 35 year old neglected old back yard) fun. Thanks for taking us for a walk in your backyard. Thanks, Pam! I hope you enjoy gardening in your backyard as much as I have mine! Gardening affords lots of room for creativity, learning and personal expression–have fun! Perplexed! I think I may have taken photos of yet another groundsel. The flowers of “mine” look identical to yours, but the leaves seem to be yet a different shape. Unfortunately, your friendly non-gardener is going to have to make a trip back to a ditch one county over to take more photos and really explore, but, heck. What else should I be doing? Going to the mall or watching tv? I don’t think so! If I can figure it out, I’ll report back. Those “groundels”–their flowers look similar, but the foliage and growing habits are different. I’ve learned to get good photos of the foliage, just for that reason. 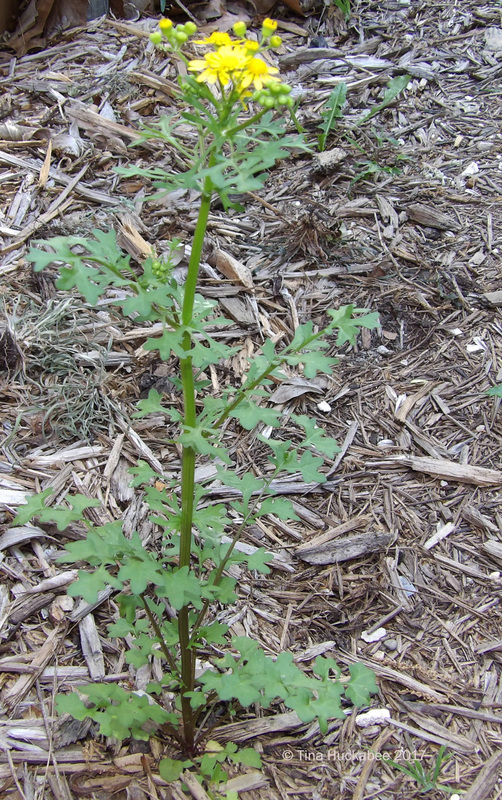 Recently, I mis-identified a groundsel-type on the native plants FB bunch–boy, was I corrected! They don’t mess around, that group. I’m learning too. It took waiting for another season to roll around, but yesterday I went the extra few miles to the San Bernard refuge and found a few of the plants that mystified me last year back in business. This time, I took photos of the leaves. When I looked at yours, and a couple of other photos I found, I’m pretty sure my plant actually is the butterweed or yellow-top: Packera glabella. The plants are so new that the foliage hasn’t really developed, but that shape is pretty distinctive. What do you think? Wow! What a view! They look like Packera to me, but I’m just a lowly gardener. The Packera as a group seem to be some of the earliest spring bloomers–my bought Packera obovata are just beginning their bloom cycle, but there’s been no reappearance of the P. glabella. Sniff. And after seeing this, I’m wondering if the two big, yellow fields I saw might be filled with butterweed. More exploration is needed! I love that your garden seems to shine all year with bright sunny colours. What a serendipitous self-seed too. Isn’t it great when that happens? It is so great when a garden gift appears–I love it! Tina what a great surprise to find that mysterious flower was “cousin” of her precious Golden Cane Grass! Yellowtop is very pretty too. When you discover a wild flower (also pretty) it is as if you discover a treasure: at least that happens to me. Good luck with the new flower. Greetings from Margarita. Thanks, Margarita!.I think most of us who love plants REALLY love when a good one unexpectedly appears. Glad things are springing along for you, Beth! I always learn something new from your blog, Tina. 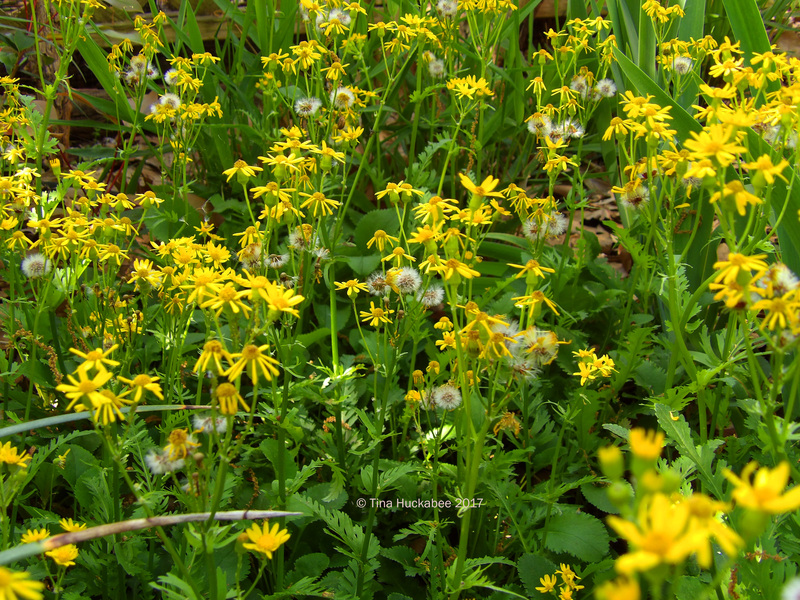 Now I’m tempted to try Golden Groundsel in the “cedar forest” at the back of our property. Its cousin is pretty, too, and the difference in foliage is fascinating. Hi Mary! I’m tickled that you want to try the golden groundsel–it’ll be beautiful in a woodland setting, as that’s where it tends to grow naturally. It’s deer resistant, too, if that’s something you have to consider. Good luck with it! 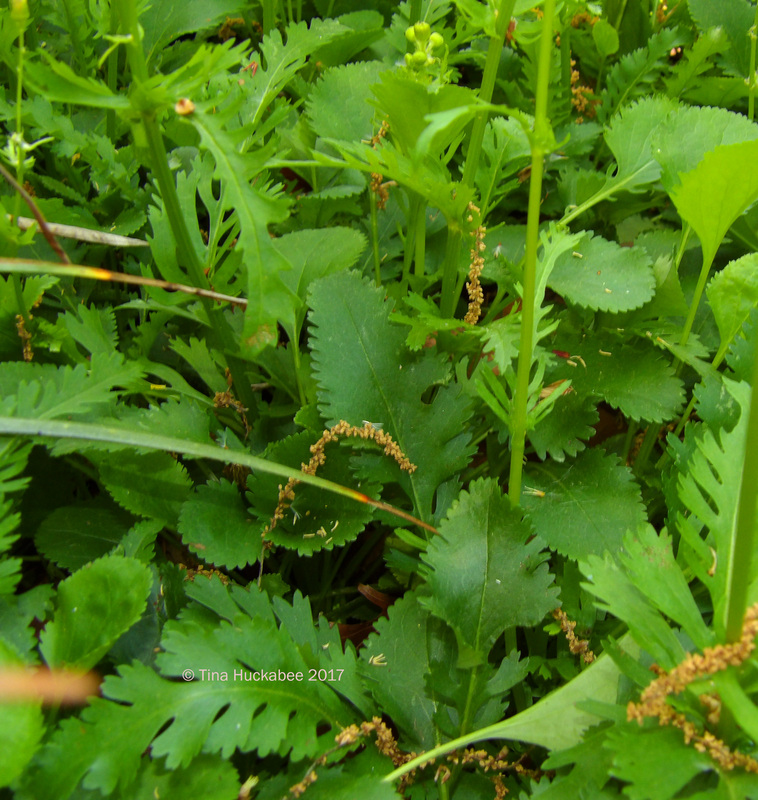 I was reading about packera obvata as I have a bunch to plant, and discovered this blog. I love it! Thank you. Thanks for reading, Marilyn! You’ll love the P. obovata, it’s a great addition to any garden.